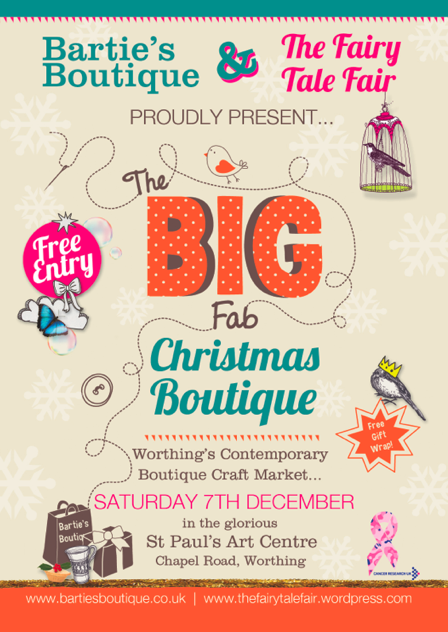 Just one week to go until our collaboration with Bartie’s Boutique next Saturday the 7th December! 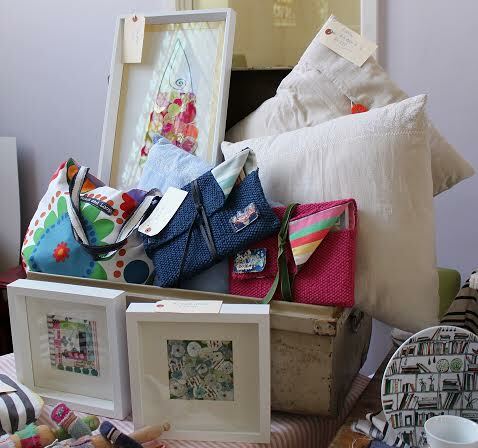 Join us for nearly 40 stalls of local designers & makers selling their wonderful wares- not to be missed! A great opportunity to get your Christmas gifts unique and handmade this year, and avoid the stress and hustle and bustle of the high street chains. 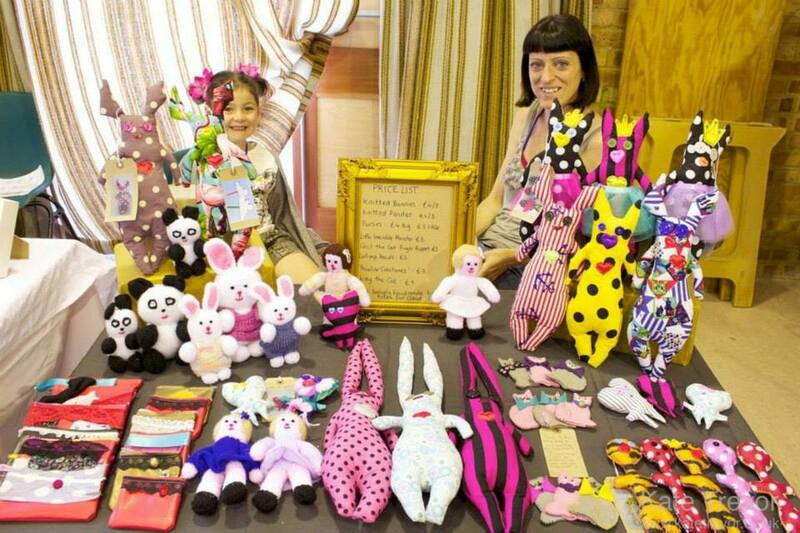 Here are the sellers that will be joining us as part of the 10 stalls representing The Fairy Tale fair. 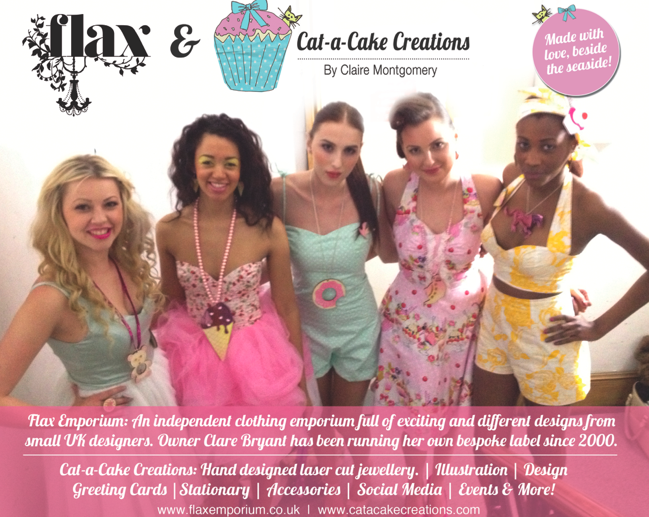 Look out for their blogs on here over the next few days too! Also in case you haven’t heard Saturday the 7th December is Small Business Saturday! So Whatever you do on 7 December 2013, make sure you come and see us to support Small Business Saturday #SmallBizSatUK. Join our facebook event for all the latest. 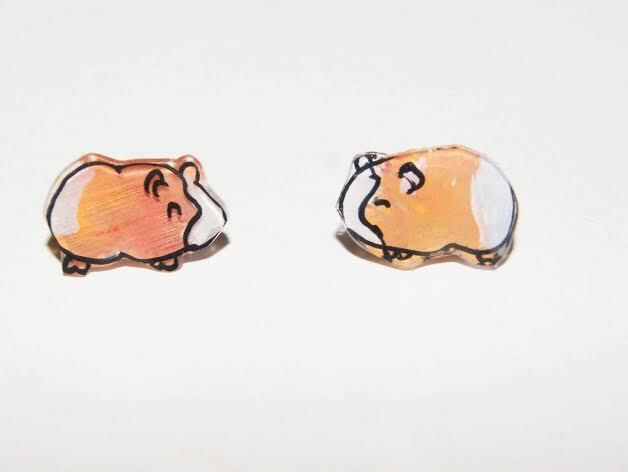 I’ve been using shrink plastic for about 2 years now, I’m a trained silversmith but at the moment I prefer drawing and painting so this material is the perfect thing for me! special festive items planned to sell? 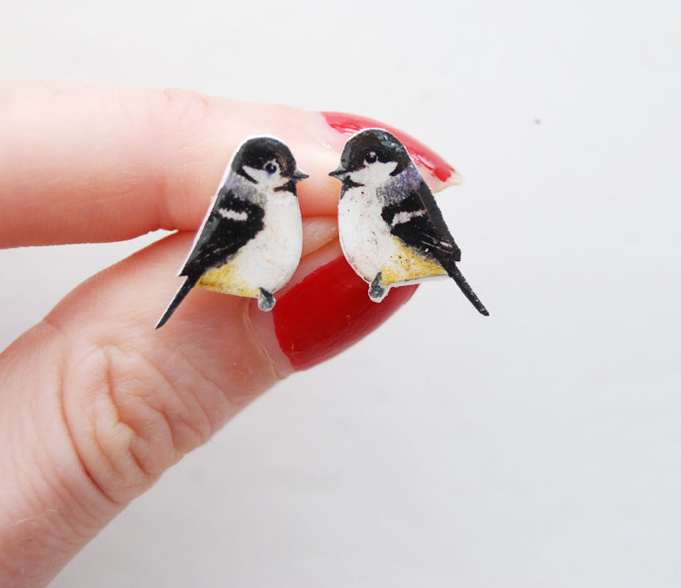 My best sellers are my hand painted bird earrings. 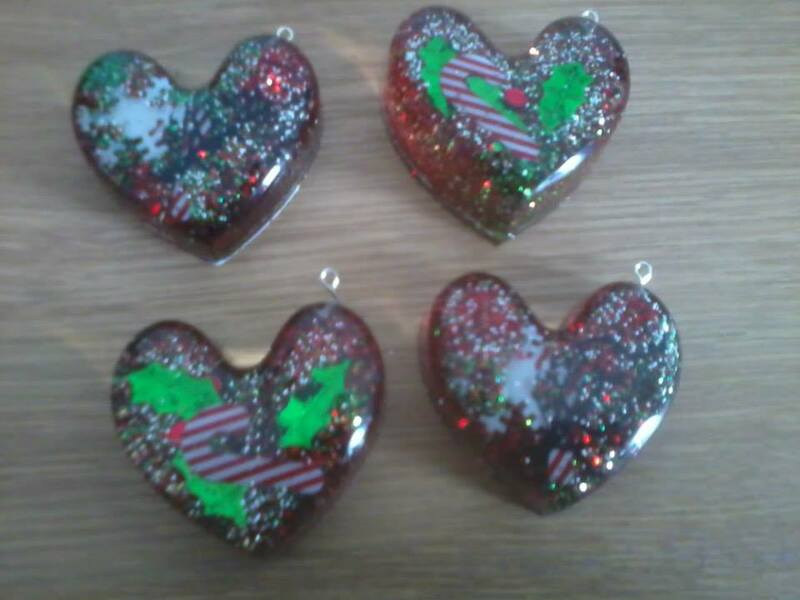 I’m very excited about christmas, I’ve never made any specifically festive items so this year I’m trying a few new pieces. Basically I’ve drawn Santa hats on everything! I love creating things and it makes me very happy when someone’s face lights up because of something I’ve created. 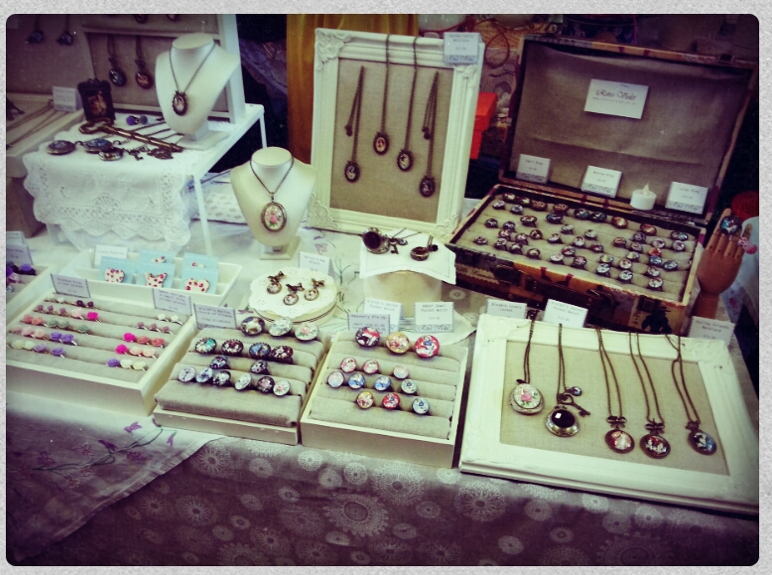 I’m a full-time maker so yes I take part in many fairs and events. 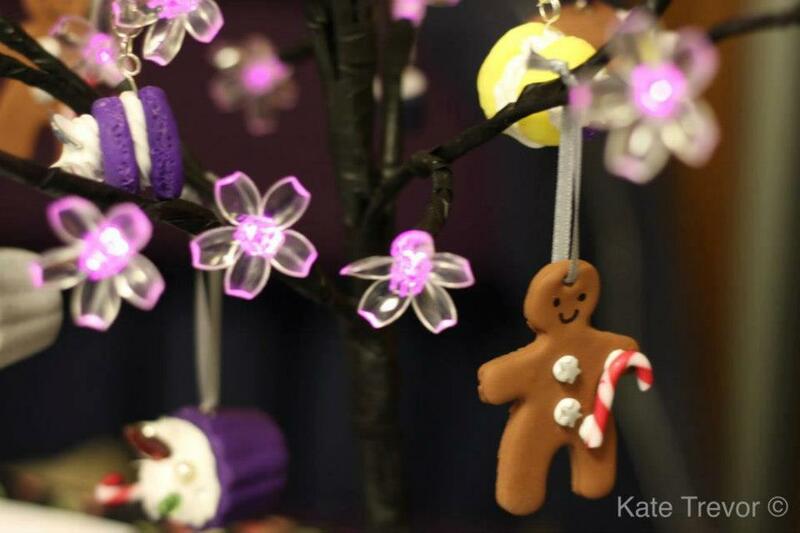 I’ll be at Craftaganza and Craftyfox market in December and at the Powder Christmas fair later this month. Well my plan was to do this full-time and luckily I’ve achieved that, now I just want to keep growing as a business and keep enjoying it! Mulled wine, fairy lights, christmas music, food, loved ones. Hi, I’m Fliss. I live in Hove and I work in mental health services. I’m studying to hopefully be a psychotherapist one day. 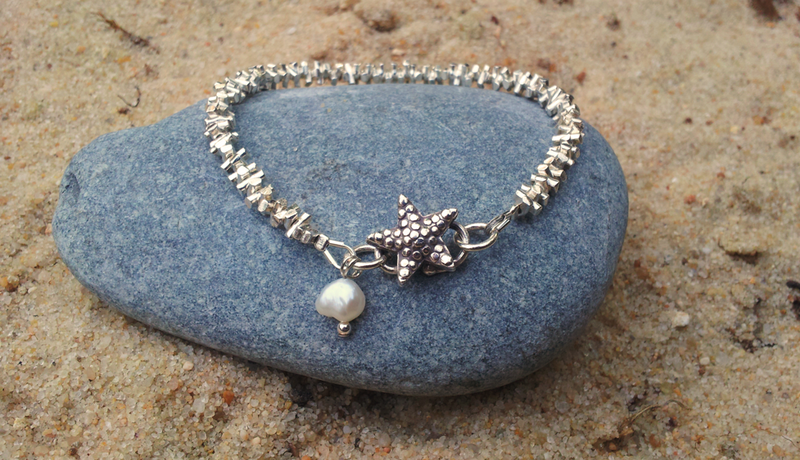 I like to entertain myself with yoga, skating by the sea, and making jewellery and accessories… it gives me a great excuse to collect lots and lots of shiny things! 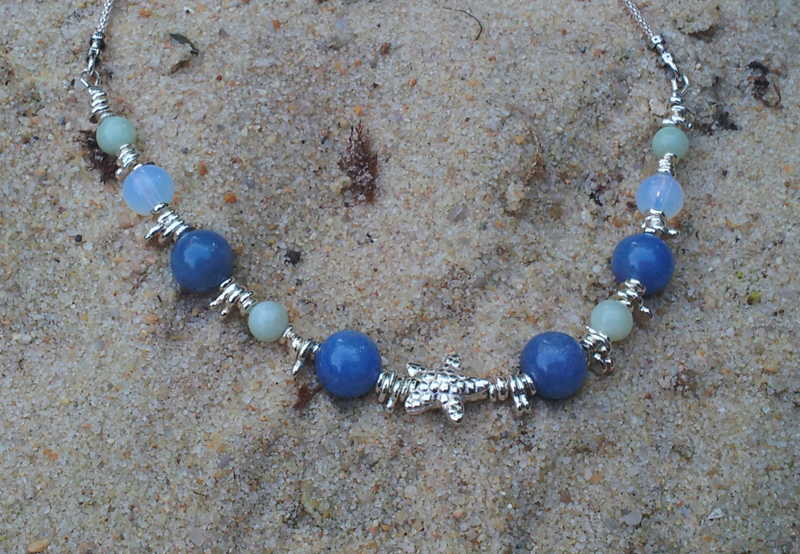 I’ve been making jewellery for just over a year now. 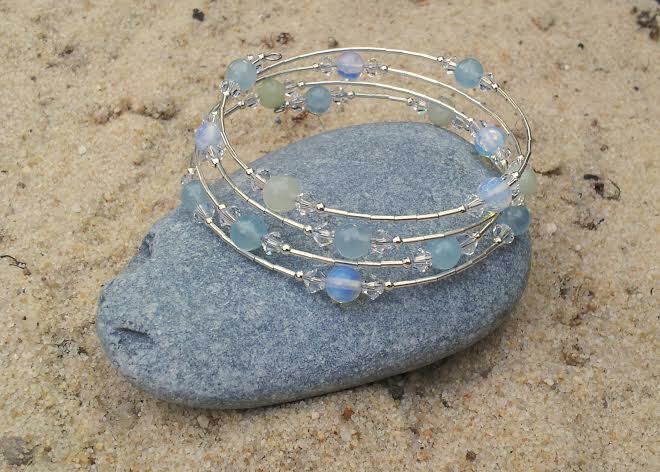 I was inspired to have a go after a friend made me a memory wire bracelet. 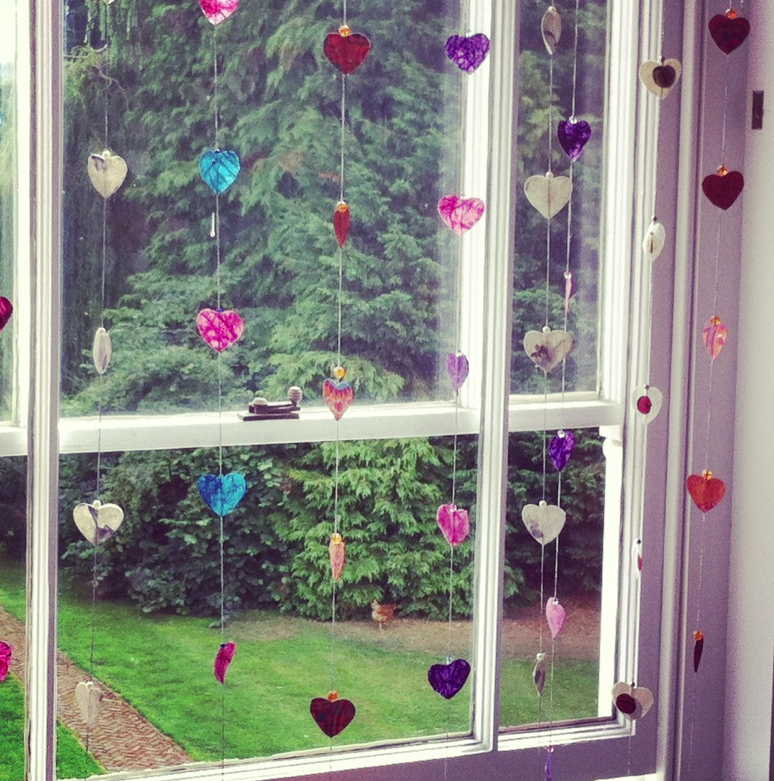 It was a great way to make use of my half forgotten collection of beads! 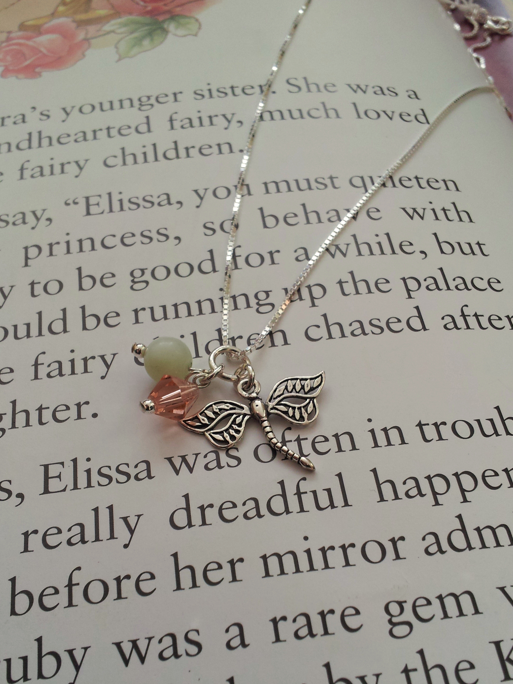 Necklaces are my best sellers; the silver chain with the little ‘two birds on a branch’ pendant and my newer range of coloured glass pendants on black lace. 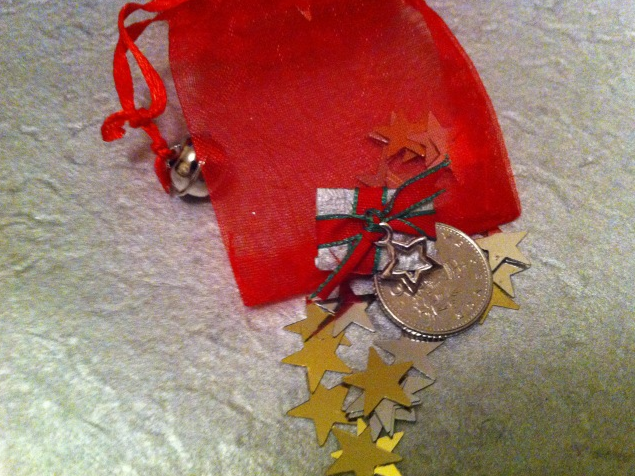 For Christmas I’ve been making some special festive earrings and giant pins, with snowflakes, holly and candy cane silver charms. 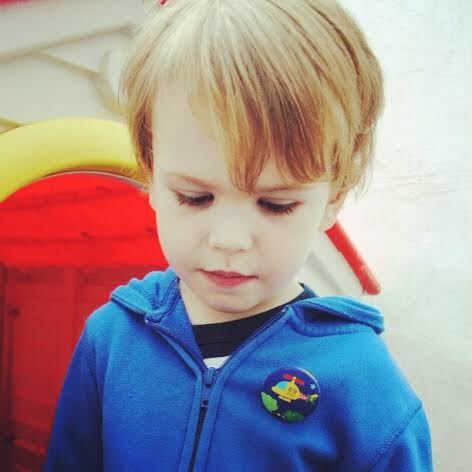 I’m also adding a collection of shiny things for boys, so perfect stocking fillers for everybody! 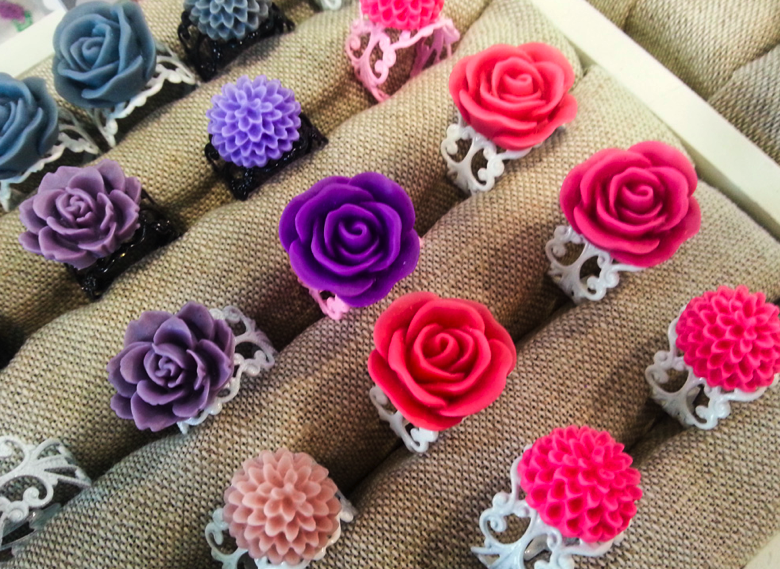 I love seeing my range of jewellery getting bigger and better, and designing the craft fair displays. It’s great fun to set it up and show lots of people what I’ve been making. Yes, during this past year I’ve attended a few craft fairs in Brighton & Hove (Brighton Craft Fair, Brighton Craft Alliance), Worthing (Bartie’s Boutique) & London (Brighton Belle’s at Old Spitalfields Market). 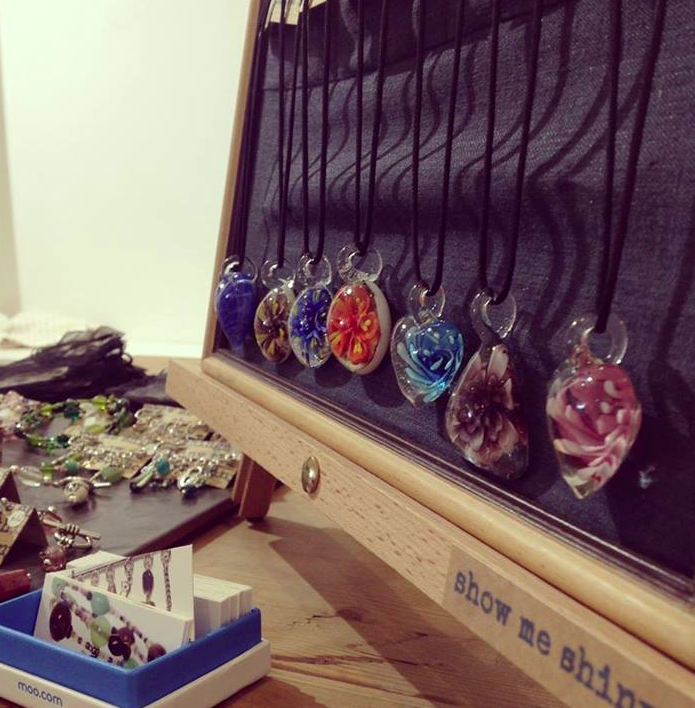 I’ve also had jewellery on display at the lovely ‘Sunshine Books, Art & Coffee’ cafe on Hove Street since the May Open Houses. 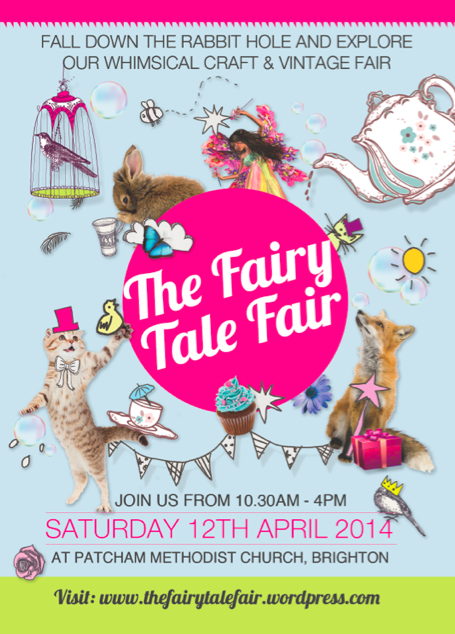 This will be my third Fairy Tale Fair, very excited! I’m planning to do some work on photography and online sales in 2014. I want to set up my etsy shop, keep working on my facebook page and I would love to get some items on ‘not on the high street’. 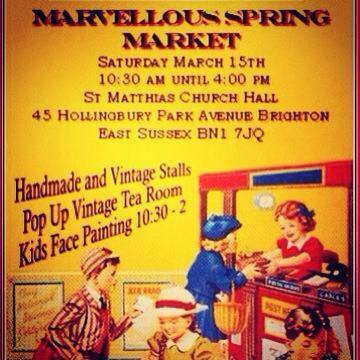 As well as continuing to get to craft fairs and markets! Lots of new shiny things!! 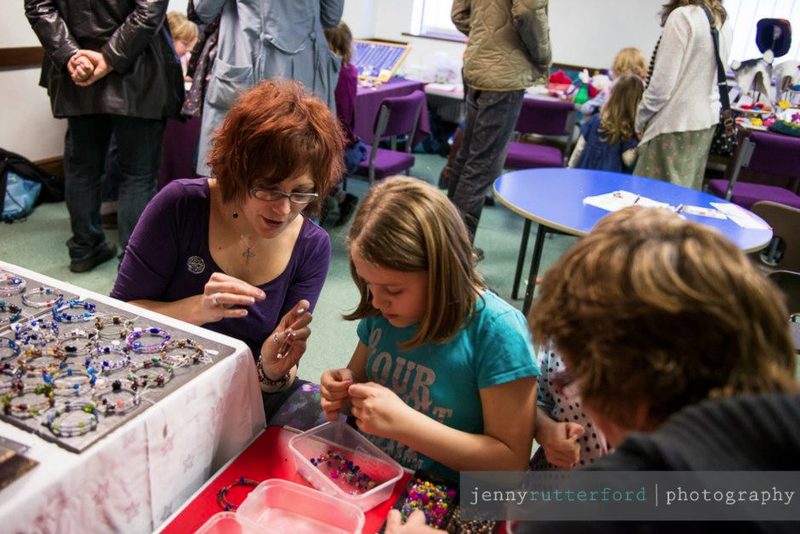 It’s always excellent fun being part of the Fairy Tale Fair, and especially running the jewellery workshop making bracelets with kids. None of this would be possible without Claire’s hard work, so a big thank you! 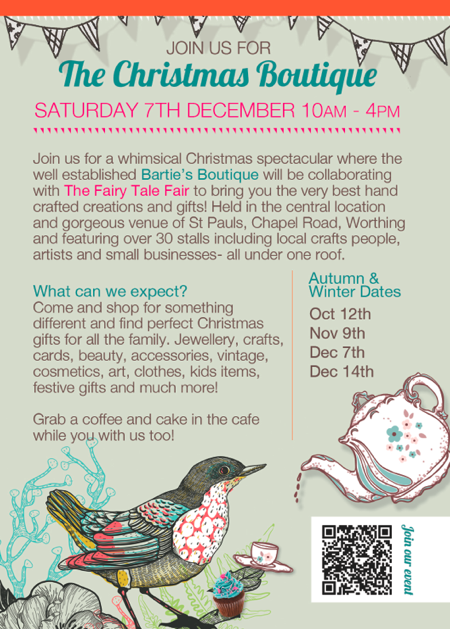 Here’s to a magical fairy tale Christmas fair!! 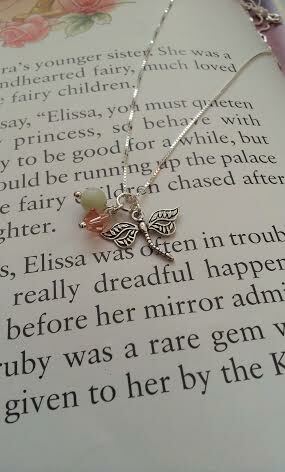 I am a total magpie, so anything sparkly or pretty gets my attention. 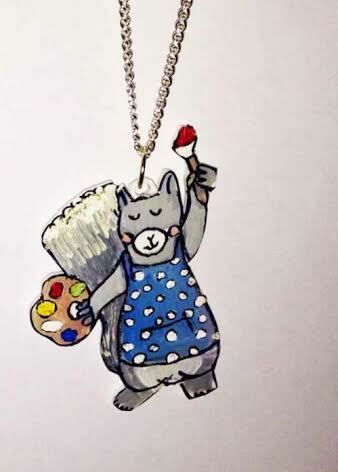 I used to love rooting through my Grandma’s jewellery box for charms and trinkets and the cameos always really appealed to me. So much of what I do now is cameo related. I have always had a fascination with faces and the stories they tell. Eclectic and nostalgic. My jewels seem to range from classic vintage inspired cameos to ultra modern neon skulls. I just create a mishmash of everything I love. 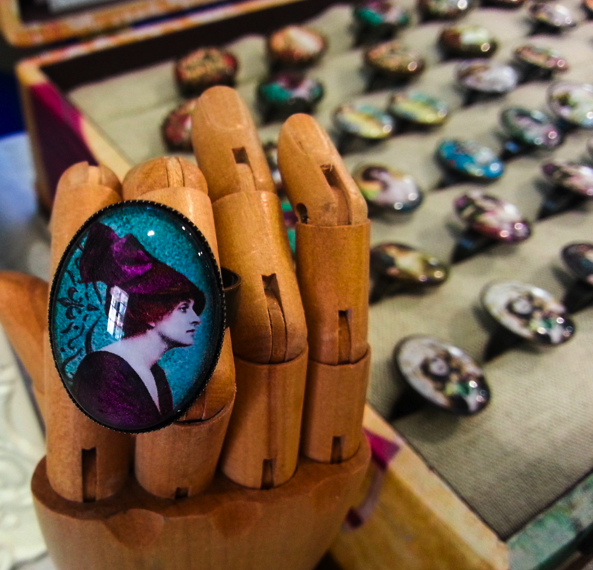 I started in October 2011, with one mission: To make a Queen Elizabeth I cameo ring. I always wanted one! I got a little side tracked, made other things and built up a bit of a collection. When I did eventually make the ring, she was a sell out. The animals always seem to go down really well. 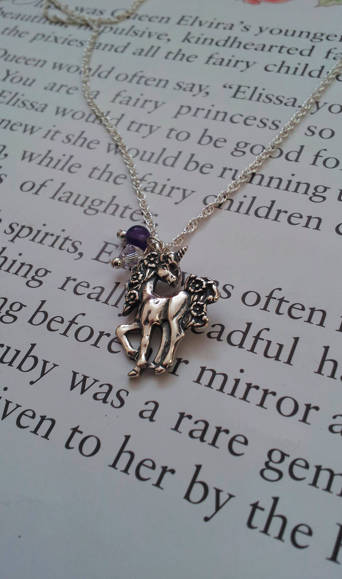 My other top selling items are probably The Henry VIII charm bracelet, Lord Pug Necklace and the feather bracelets. 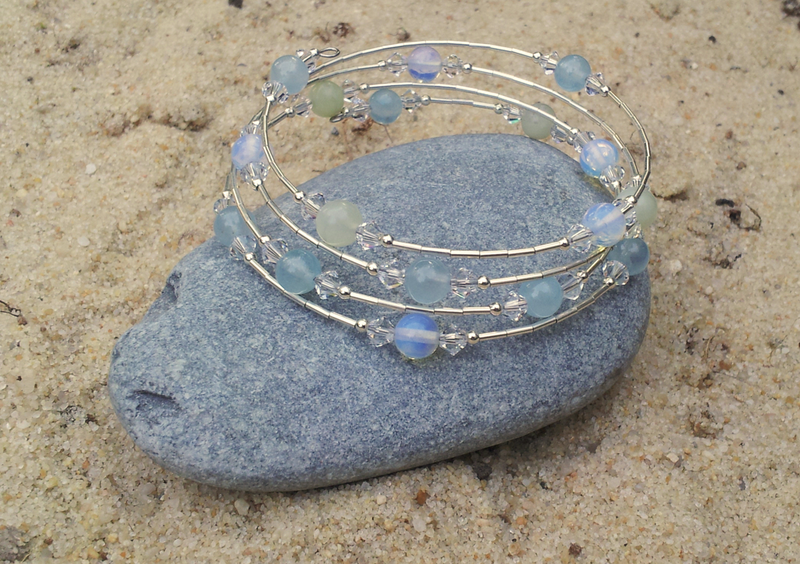 It’s exciting when I have a brain wave and I’m inspired to make something new. I love rooting around for findings. Meeting new people is fantastic too! I made a very close friend through the craft fairs. 3 Days to go! Join us and Take Part in a Workshop! 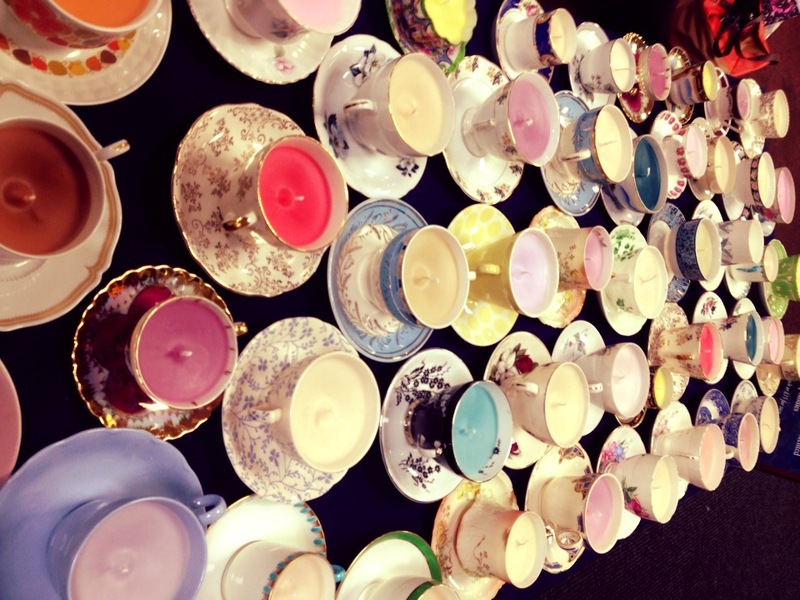 Reason 3 to visit our fair this Saturday the 10th August: Take part in one of our workshops! 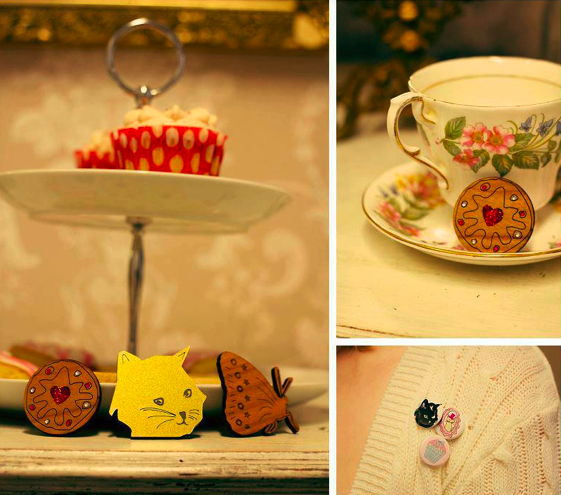 We will have a craft workshop room full of delights to take part in, suitable for all ages! 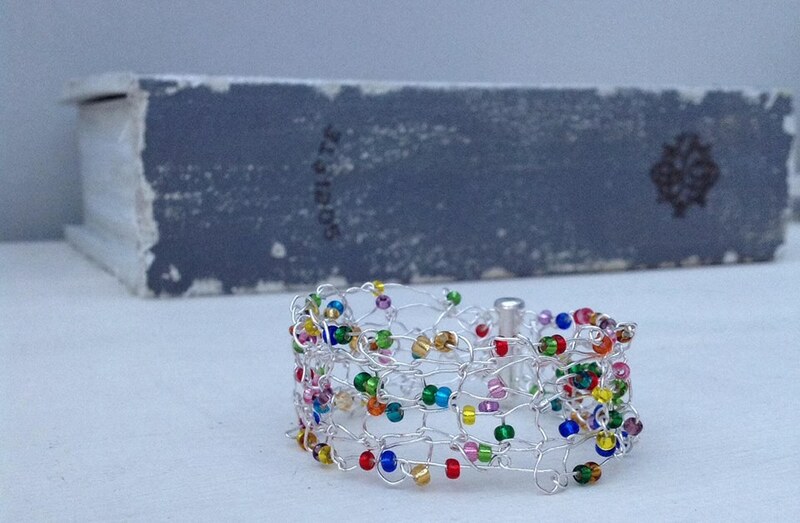 Show Me Shiny things– beaded jewellery workshop. Make your own jewellery to take away, lots of fun to be had with big selection of wonderful beads! 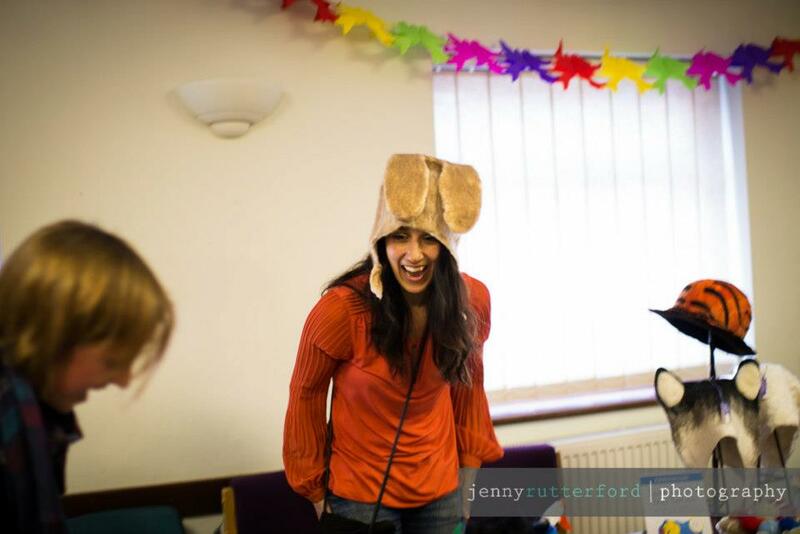 Karen Rao Felt Artist– wet felt workshop- create a 2D cute animal character, gift a felted rock or make a felt ice lolly- the possibilities are endless and this workshop is always popular with all ages! 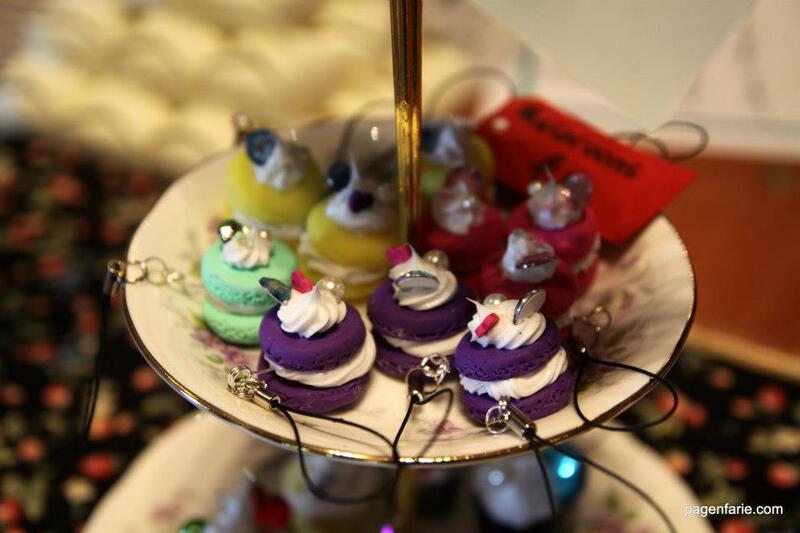 Mini Patissierre– Polymer clay jewellery workshop. 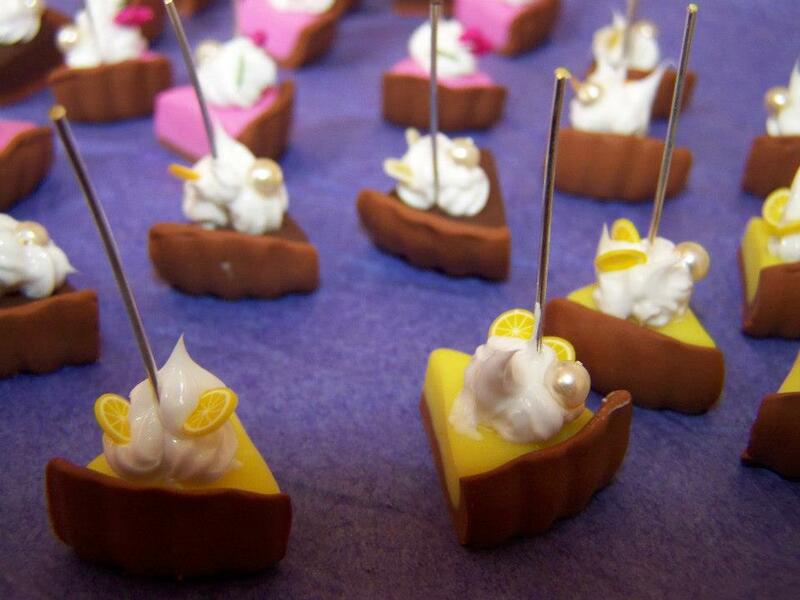 Learn the art of making miniture creations from polymer clay, then take home to bake youself. 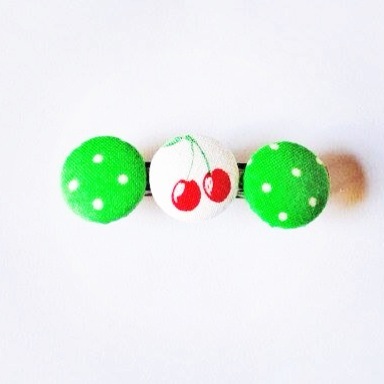 Make a mini clay cake, or doughnut or anything you wish! 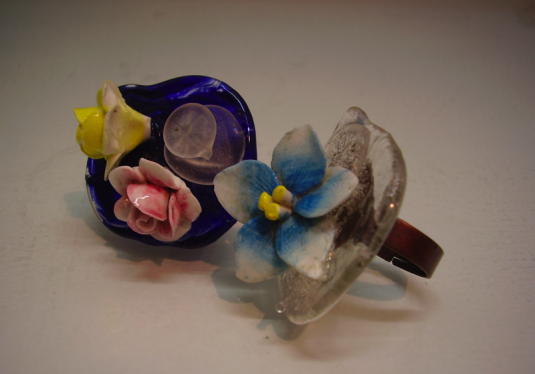 AnneMarie Hughes: Fused Glass workshop. 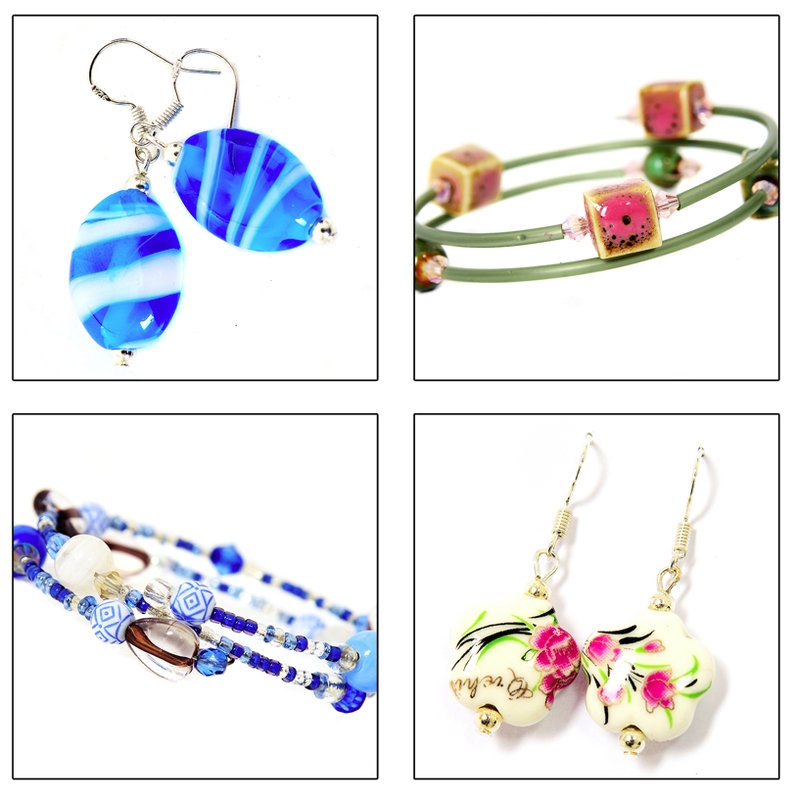 Learn the art of how fused glass jewellery and creations are made. Annie is bringing a mini kiln to show you the process from start to finish. Demonstrations throughout the day. Emily Makes– Make a wonderful sweetie butterfly. 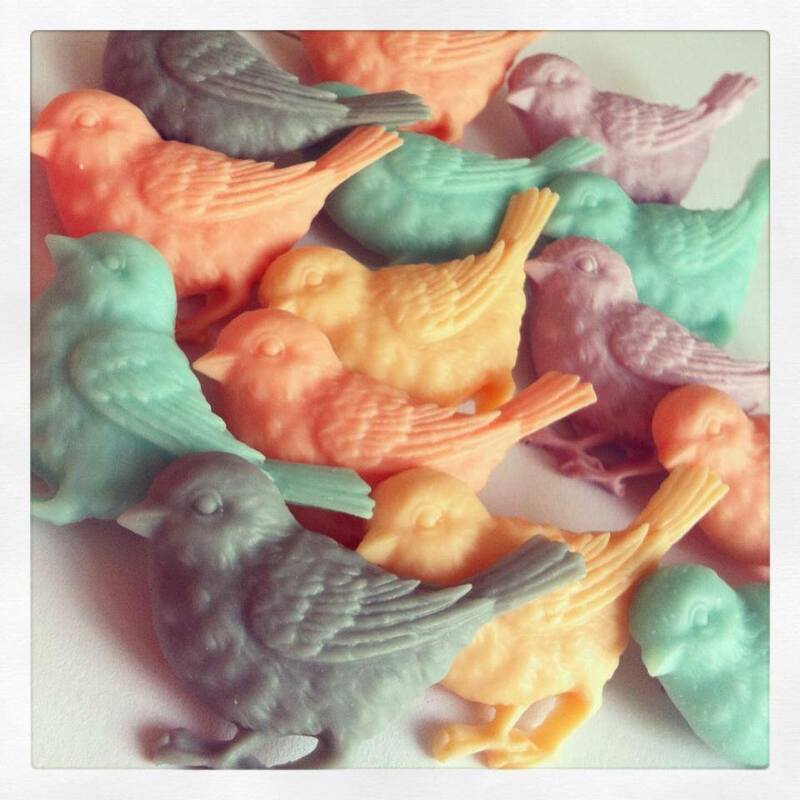 One for the kids to enjoy making the cute and colourful character to store a few yummy sweeties! 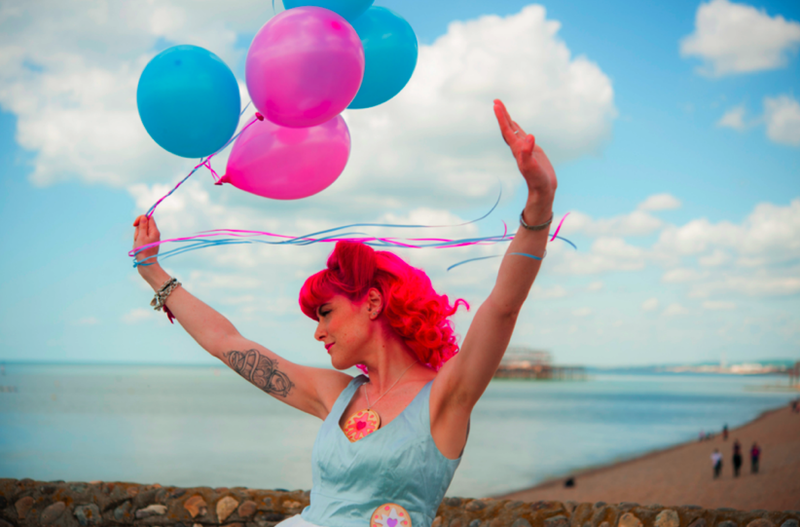 Also in the workshop room will be I Do Brighton Beauty who will be providing a range of beauty treatments at special prices for the fair. 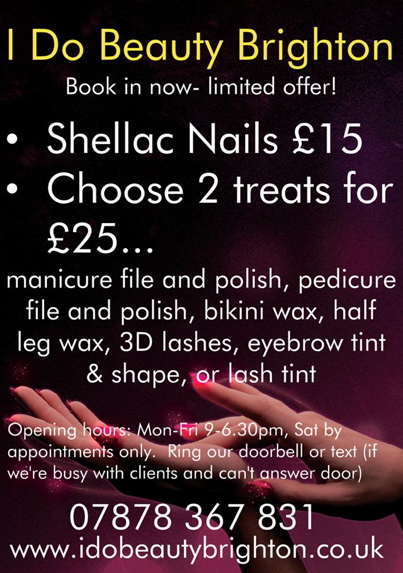 Including manicures, pedicures, massage and more. Find out more in her interview post here. Can’t wait to see you all take part in a workshop on Saturday! It’s going to be magical!! 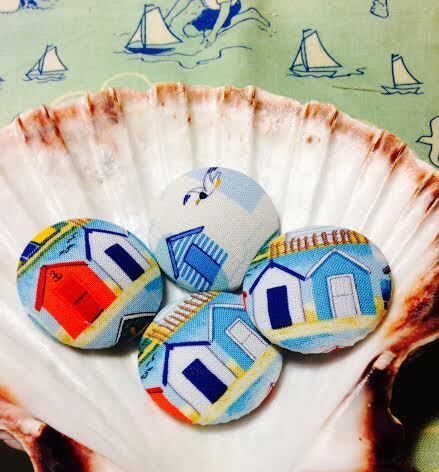 Hello, I’m Chloe, owner and designer of The Silver Hut. 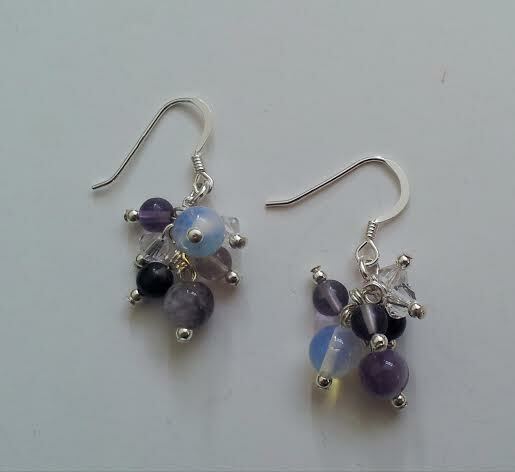 I make 925 and Karen Hill Silver, gemstone jewellery which I sell at lot’s of local fairs and markets as well as in my online shop on Etsy.com. I like to use inspiration from the natural world around me. 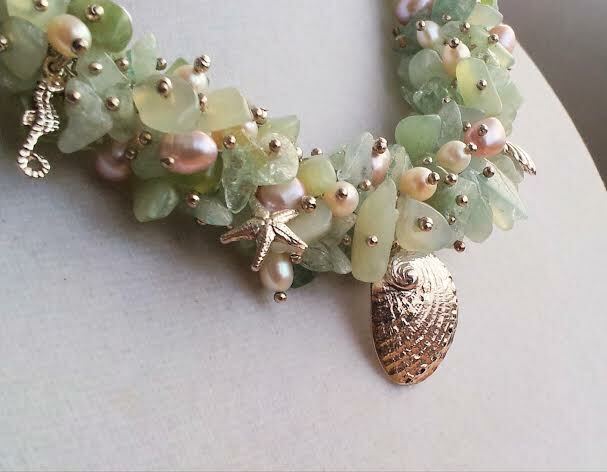 I have a large collection which is focused on the beach and sea life, living in Brighton there is always something about which helps me spur off a new design! I also have a collection which focuses on plants and flowers and combines mythical and magical creatures like fairies and unicorns. 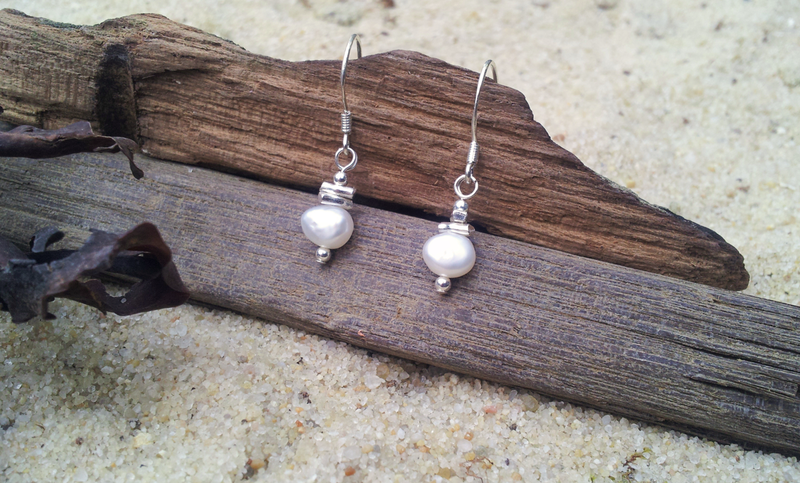 The Silver Hut has been up and running for nearly 3 years now, but I have always made my own jewellery. 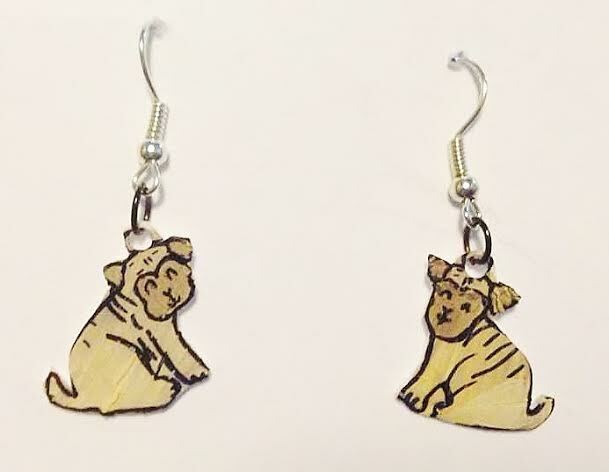 I made my very first pair of earrings when I was just 7 years old! 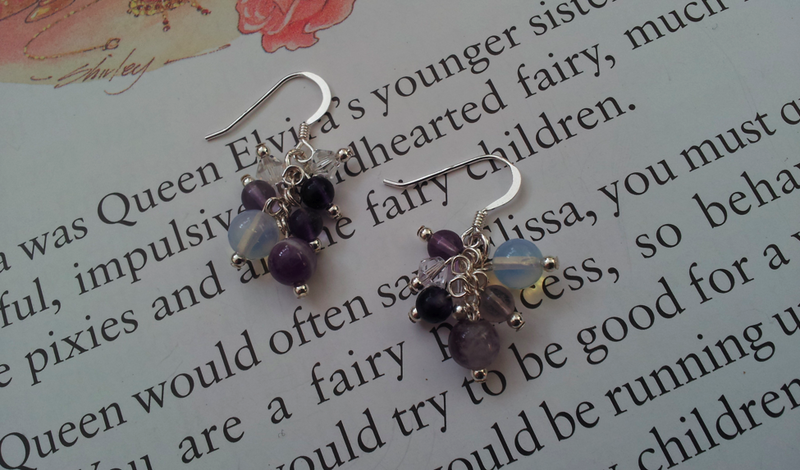 At the moment I have been selling lots of my gemstone cluster earrings, they make great presents and have so many different colours in them that they suit most outfits. They are also both casual and smart enough to wear whenever you like! I have really enjoyed experimenting with different techniques and materials over the years. I love exploring all the different colours and textures of the gemstones and I especially love all the little packets of Swarovski crystals! It is very satisfying when a design makes it from paper into an actual finished piece; even better when you sell it to a customer who loves it just as much as you do! You can find The Silver Hut stall at lot’s of Sussex fairs and markets, keep an eye on my website for up coming listings. 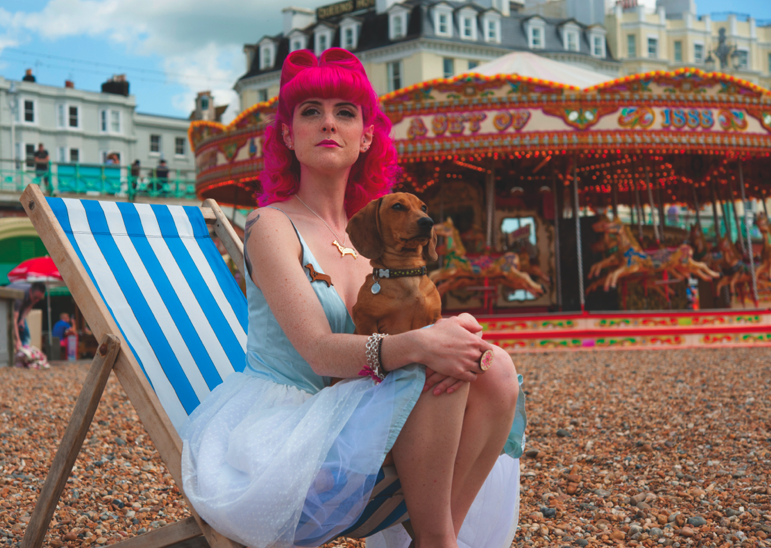 The Silver Hut also has a large wedding collection which is about to be launched as part of a collaboration with some other talented Brighton designers! Further details will also be posted on my website shortly! 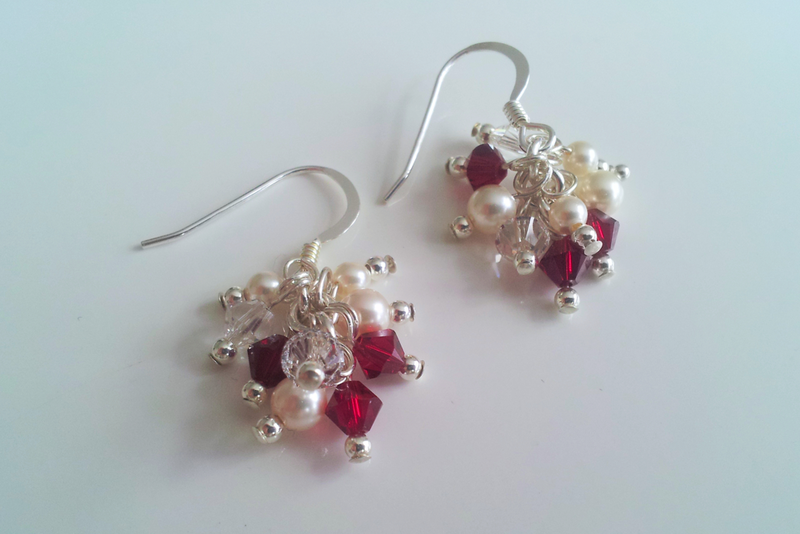 My future ambitions are to finalise my new wedding collection and to open the new website. Together with some other designers, we hope to create a new ‘handmade wedding shop’ where you can find beautiful, bespoke wedding accessories, with everything from Jewellery, Tiara’s and haircombs to wedding photographers, cakes and wedding favours, all with that personally designed touch. I have attended every Fairy Tale Fair since it started! It is my favourite fair to attend and wouldn’t miss it for the world! I love the happy vibe that you get from both the sellers and customers, there is always a great combination of crafts and with each fair it gets better every time! Yes! Miss this fair and you’ve definitely missed out! 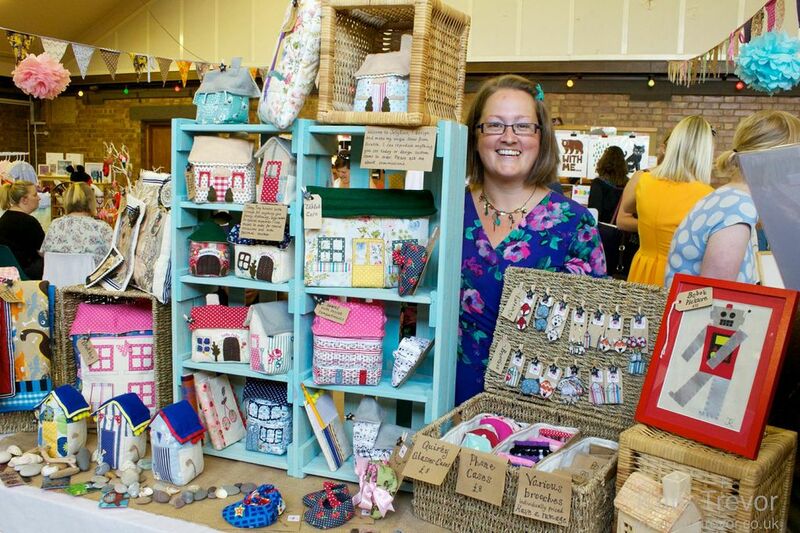 As well as organising this fair and working full time at a design studio, I also regularly sell at craft markets across Sussex. 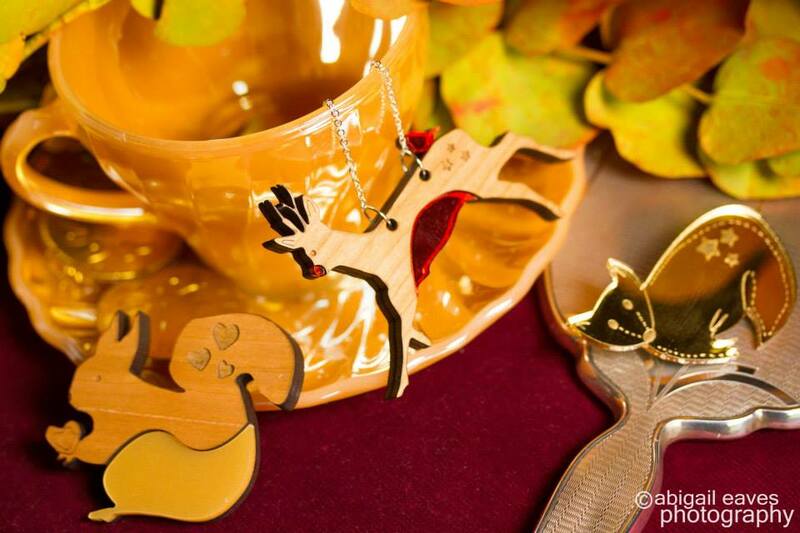 I sell a range of whimsical & animal themed laser cut jewellery, greetings cards, pocket mirrors, badges, cotton bags and more! All of my work is hand designed by myself. 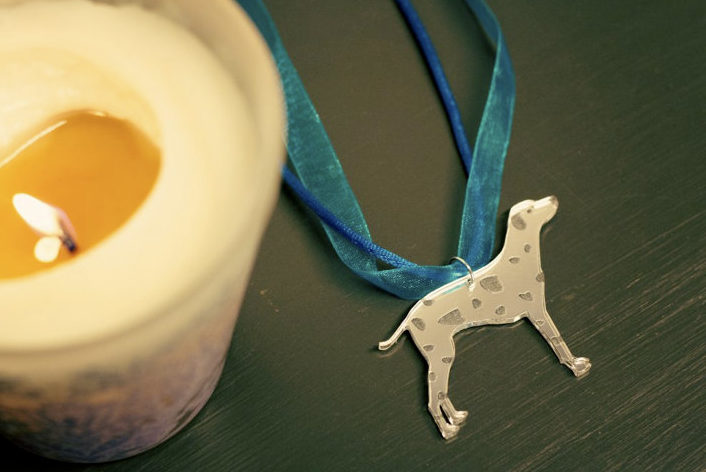 I started designing the laser cut jewellery just over a year ago and since then it has had great feedback and features! 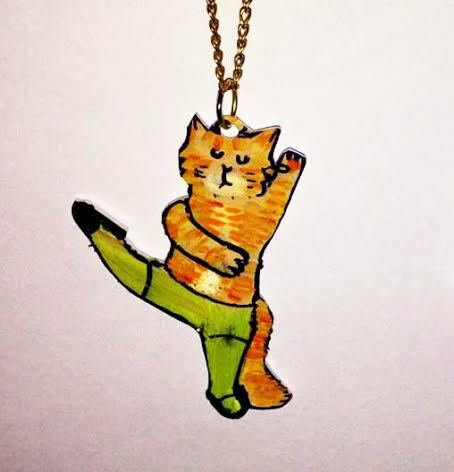 My ‘Buddy the Cat’ necklace is always popular. He is based on my own pet Buddy the cat, who is a big fluffy black cat who likes lots of cuddles! 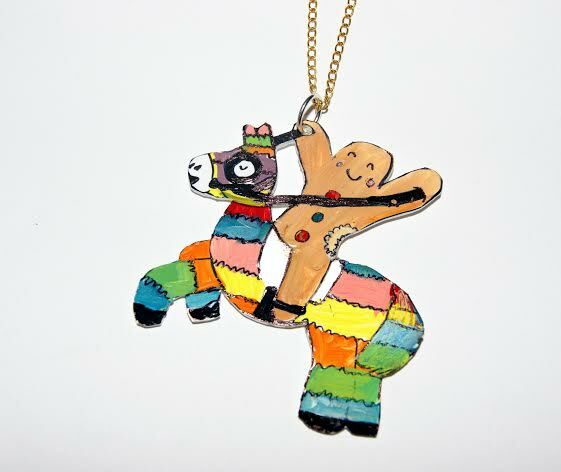 The best thing about having him as a necklace is he can be any colour I want him to be! 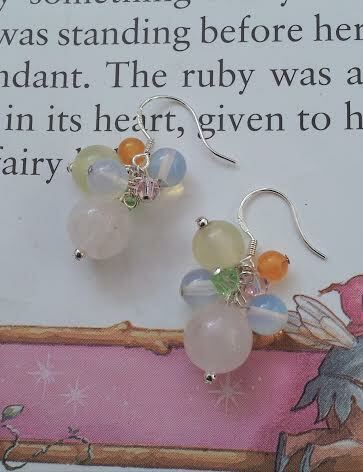 Other than Buddy then my earrings are always popular- at two pairs for £8 they are very good value and come in various cute animals, colours and all have silver plated findings and come in a little pouch to keep them warm! 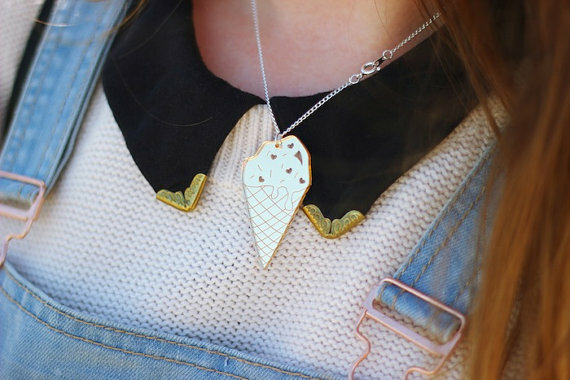 During the summer my ice cream necklaces from my new Carousel collection have also been popular- The Fairy Tale Fair will be my last fair of the summer months so get one quick before they melt! I enjoy translating a design that starts in my head, to a sketch, then to a visual, then to a piece of jewellery, then selling it, seeing peoples reactions and hearing their feedback on it is always good. 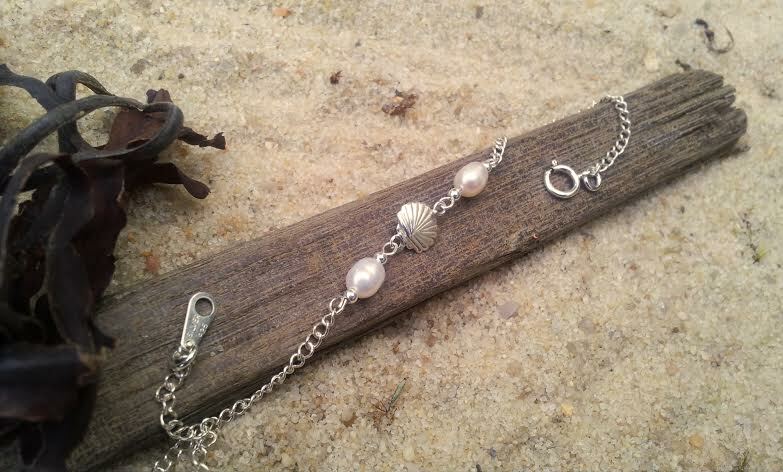 It’s a great feeling to see someone wearing a piece of your jewellery- its nice to know that it is appreciated. 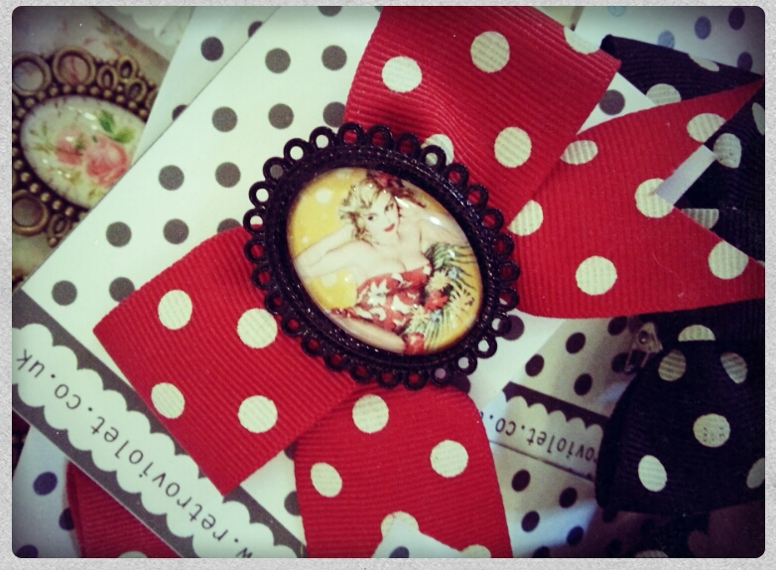 I recently sold an item from my Etsy shop to a lady in America, so Dot the Dalmatian necklace was wrapped up and sent off to sunny Florida- alright for some! 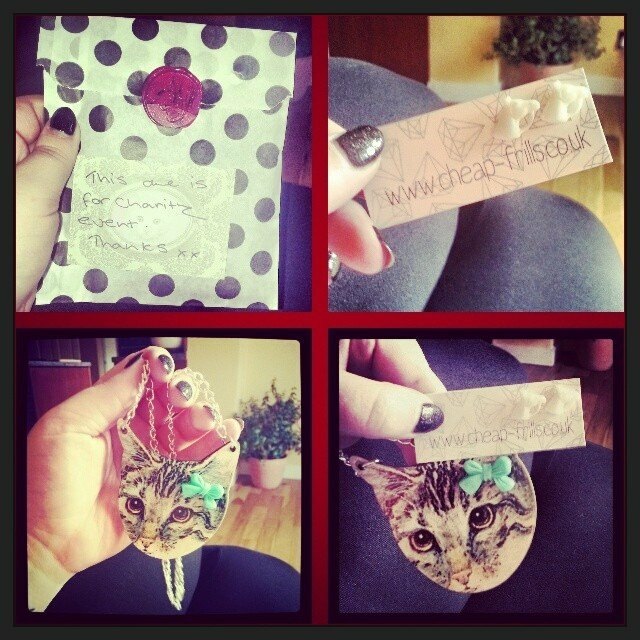 I think Etsy is great to get your work known further afield and its a great feeling knowing a little item you had an idea about is now sitting as a lovely necklace in a house half way around the world! Dot the dalmatian will also be available at the fair! 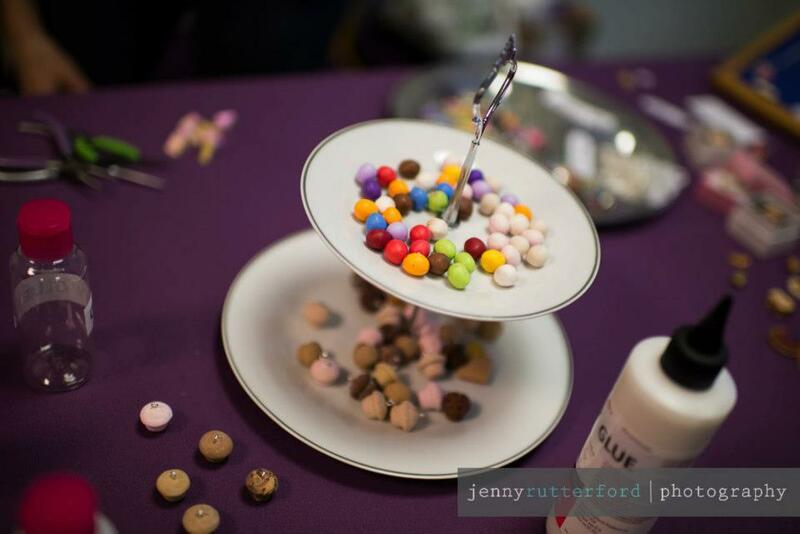 Do you take part in other craft events and exhibitions? Yes, lots! As well as The Fairy Tale Fair I also take part in Brighton Craftaganza, Makers Boutique and two Artists Open Houses as part of Brighton Festival in May and December each year. 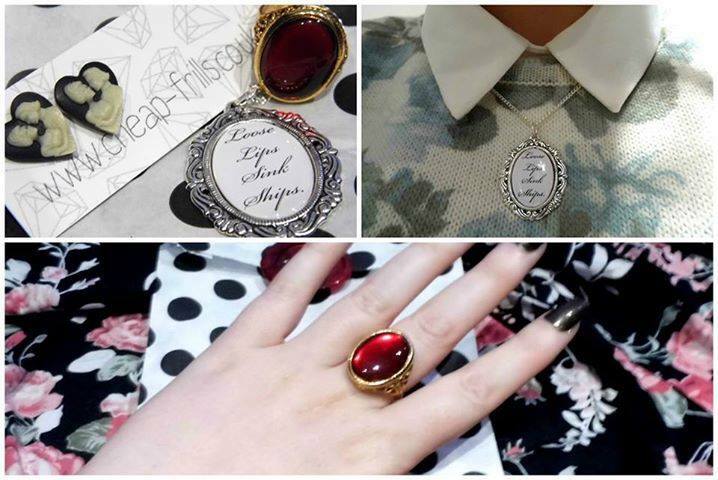 Excitingly my jewellery was also part of the catwalk collection at High Street Fashion Week in London in April this year which got great feedback and lots of features on fashion blogs. 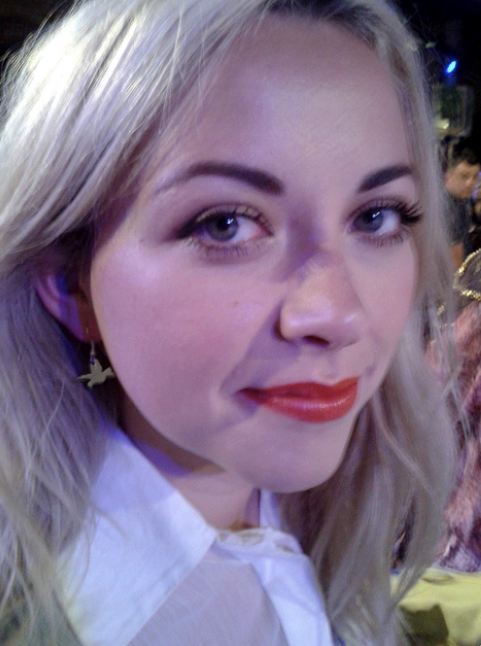 I also managed to speak to Charlotte Church at Brighton fashion week, and she wore my silver bird earrings for the event, which she was photographed in the Daily Mail the next day. I also have lots of events booked for Autumn and Christmas already- including Belle’s Vintage wedding fair- which will be my first wedding fair which I am very much looking forward to, Pop Up Vintage in Hassocks- again this will be my first vintage fair so looking forward to that too, and starting to book up for Christmas fairs too! Better get my festive hat on! 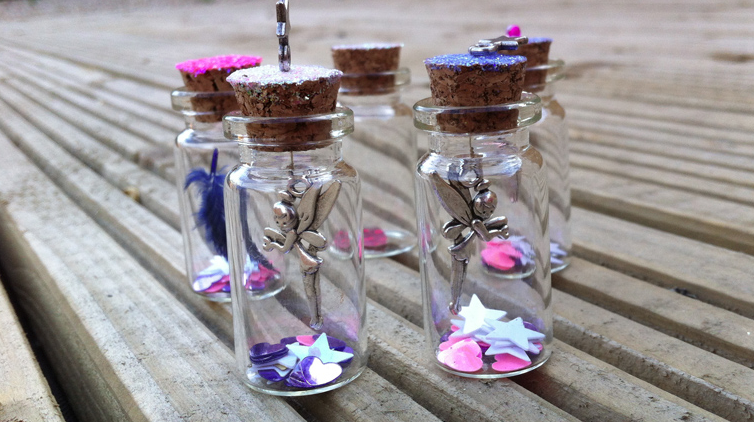 What items and summer creations will you be selling at The Fairy Tale Fair? I will be selling pieces from my new Carousel collection- including ice creams, doughnuts, seagulls, cake, teddy bears, carousel horses and more- all hand designed and laser cut locally. 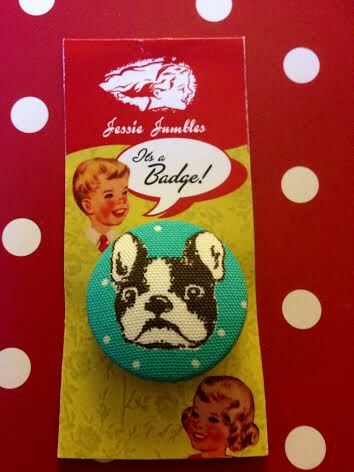 As well as my usual favorites- Buddy the cat, Nigel the sausage dog, my earrings in various animals, badges, pocket mirrors and more! 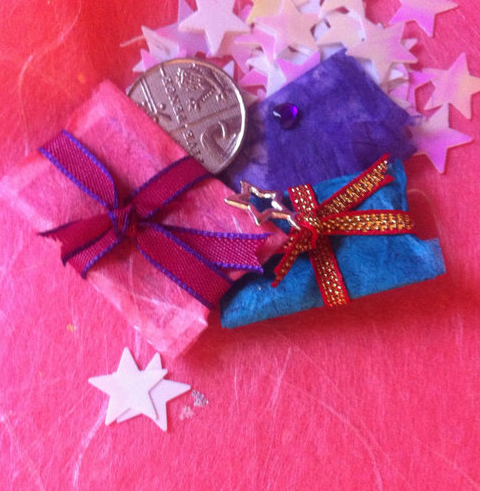 Lots of little bits for kids and nice gifts for presents or just a treat for yourself! Yes I took part, and organised it! 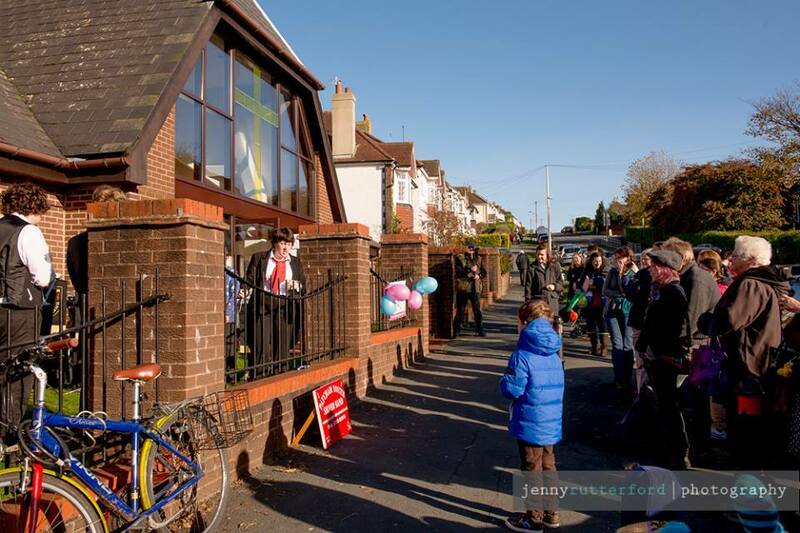 It was great to see it all come together on the day and see the happy faces of the children and customers who visited! It takes a lot of work to get the crowd in we did- thousands of flyers through doors, adverts, lots of posts on this blog, keeping up with social accounts, sending emails, contacting press and much more- but I think it is all worth it in the end. Visitors seem to stay for hours, looking at the wonderful crafts, eating yummy cake, listening to our vintage singers, helping their children take part in a workshop, getting their faces painted and much more- it really was a magical day! I hope this Summer fair that marks our first Birthday will be just as magical, we have so much to offer and come such a long way in a year, so please don’t miss it! I hope to continue to organise The Fairy Tale Fair, and help it grow. I have plans to make it bigger and expand, but I’d always like to keep its local roots as it has a real community feel! 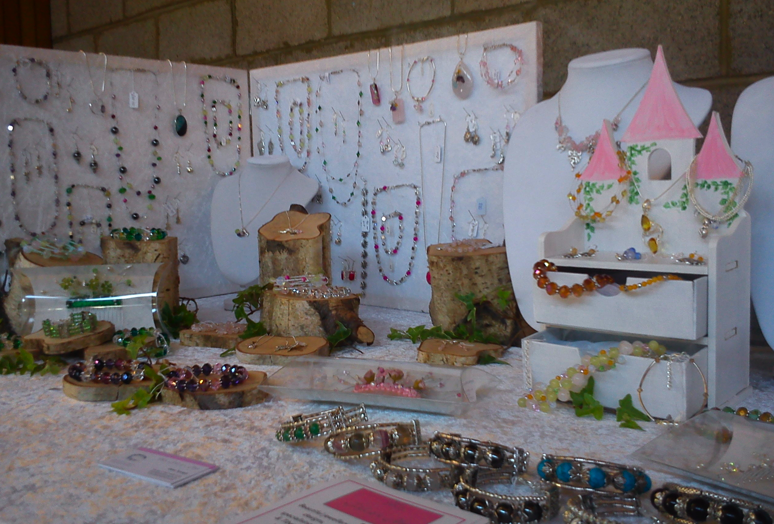 I’d also like to organise more events, such as charity events, weddings and other fairs/ markets across Sussex. I’d also like to continue to develop my design career and one day aim to have my own greeting card range and exhibit at a big trade show in London. I also have a keen interest in Children’s books. 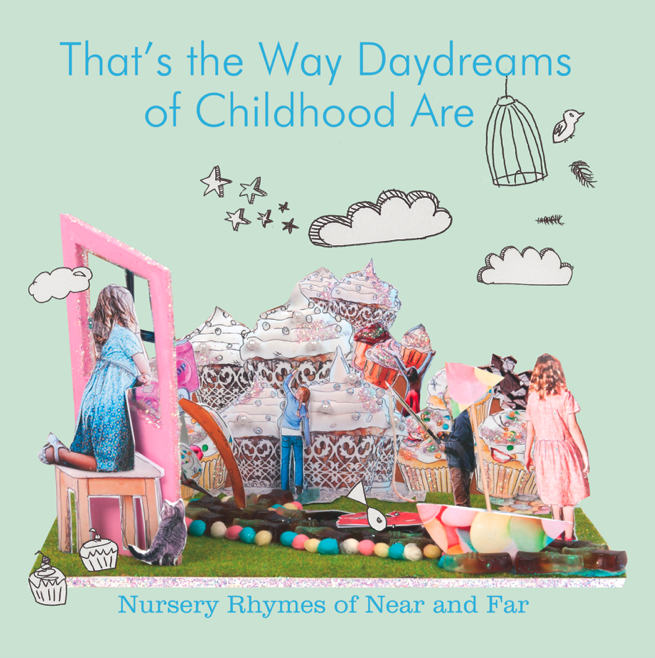 For my final project when I was at university I created a book of nursery rhymes- I’d like to continue to develop this and one day write my own children’s book too! Oh and I’d like to own a cute little cake and craft shop in Brighton by the seaside- everything would sparkle and be lovely! I am really looking forward to this Saturday the 10th August, and hope lots of you can visit our lovely fair on the day. We are open from 10.30am, and you can see full location details here. It’s a great day out for all the family and there really is something for everyone. 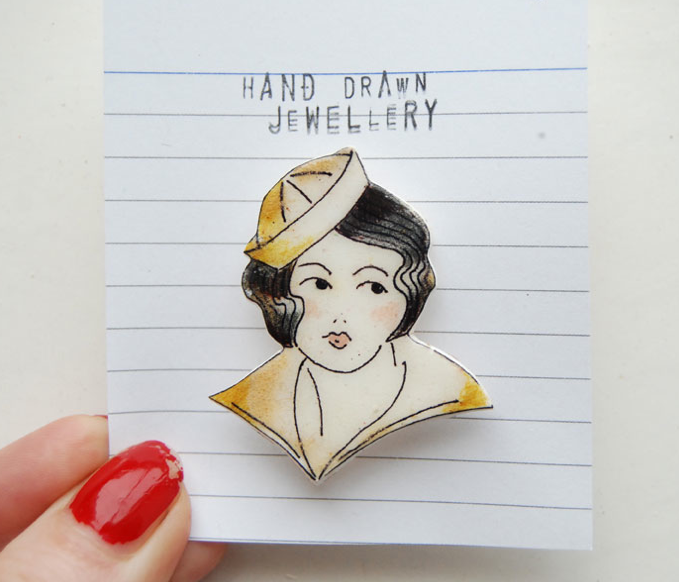 Today we welcome Emily, of Retro Violet, who makes the most beautiful vintage inspired jewellery. 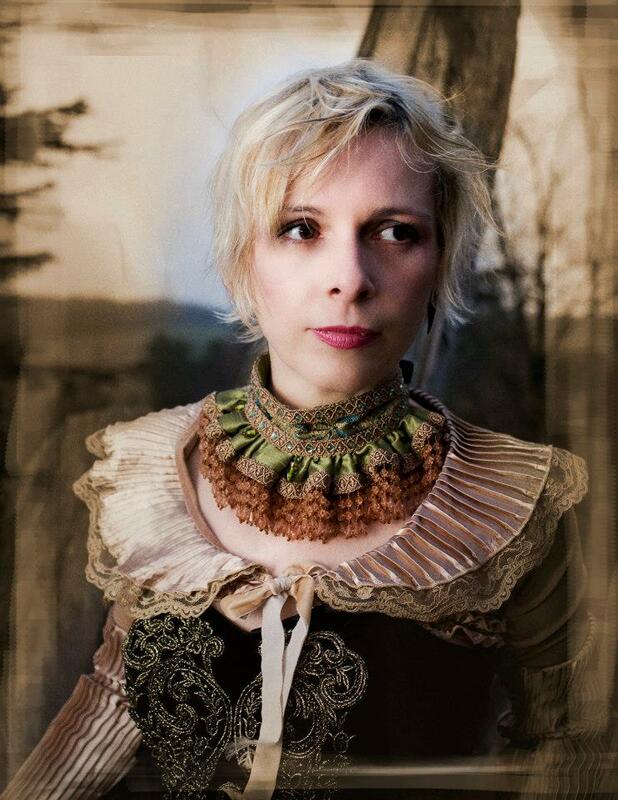 This is her first Fairy Tale Fair and we look forward to welcoming her! At University I studied Fine Art then went into Photography and Digital Design. 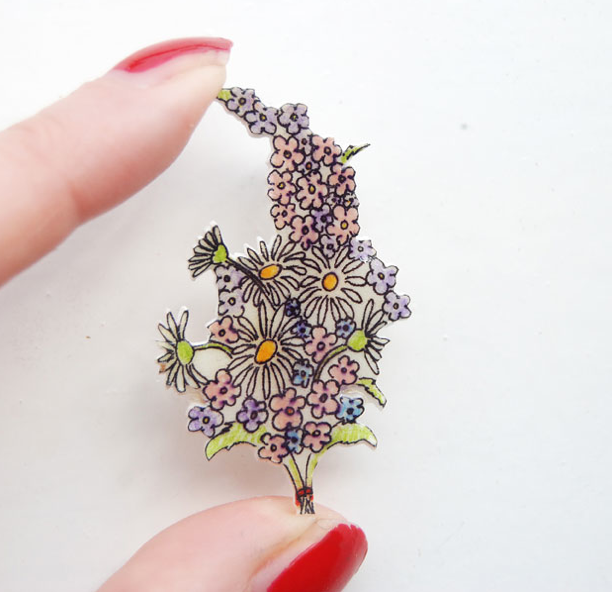 I’m fascinated by the world in miniature and I’ve always wondered how I could turn my photos into jewellery. 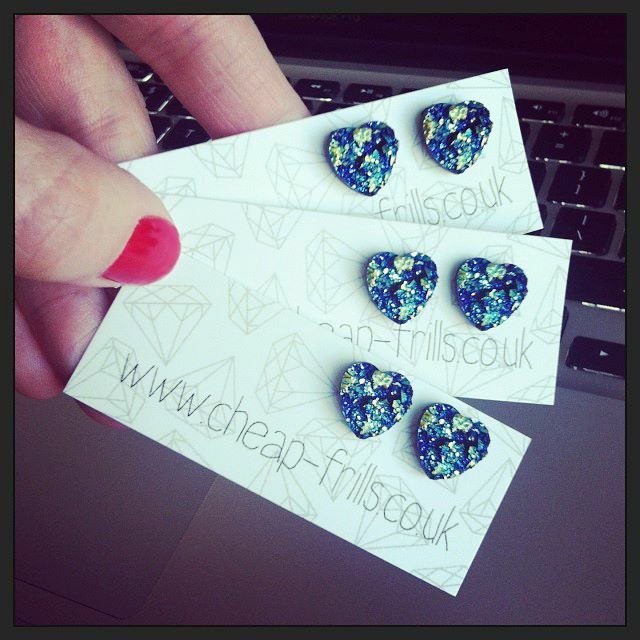 This gave me the idea to turn my digital collages into jewellery. I am keen to create something unique and make it affordable for everyone. 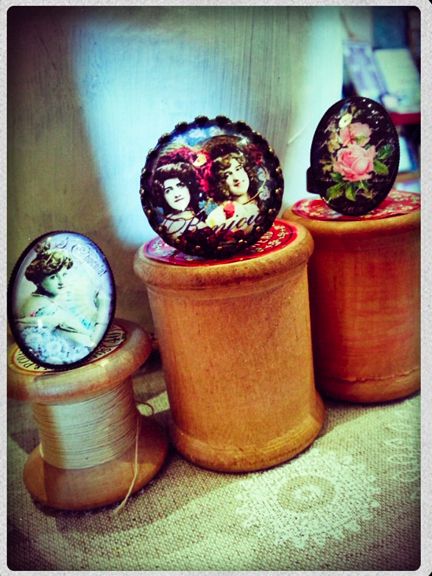 I love images from different eras and digitally layer old postcards, textures and other ephemera to make my designs. I also have a penchant for France and all things French so this creeps in too! My style is best described as modern vintage inspired, I guess! 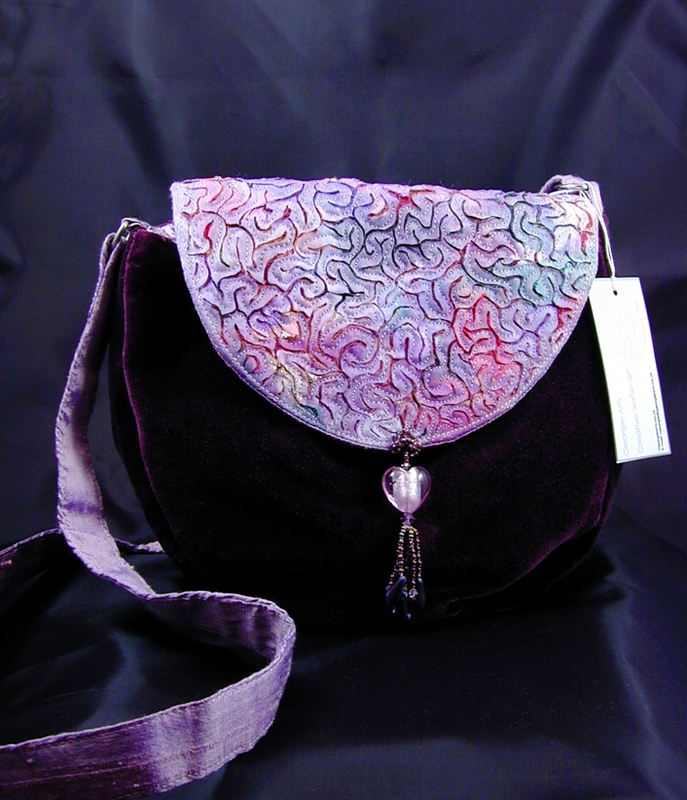 I had the idea for Retro Violet in 2010 but only really started selling in Spring 2012. 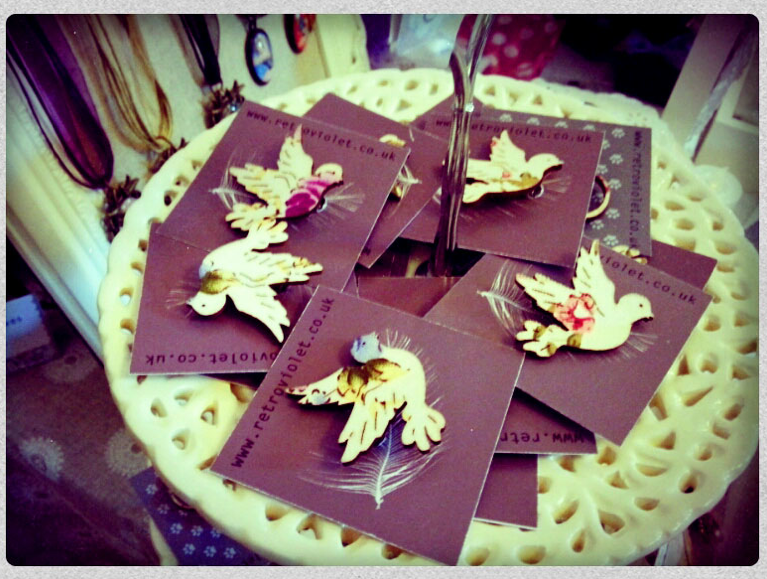 I would say my best seller is the lovely little dove brooch. Most of all I enjoy the design stage – it’s fun coming up with new ideas. 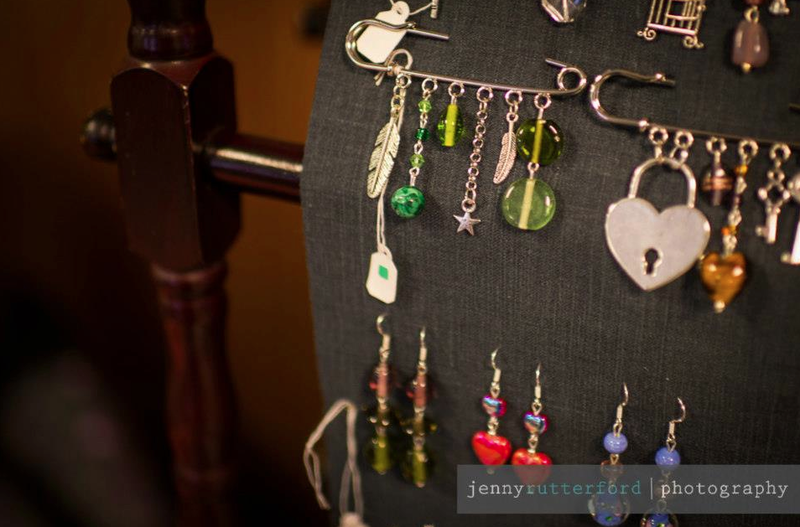 I also love doing the stalls: meeting interesting and talented people and soaking up the atmosphere. Yes. Pop Up Vintage, Hassocks / Vintage and Very Nice, Chichester / Big Brighton Fringe Fair / Johnny Loves June Vintage Fair, Shoreham-by-Sea / Floral Fringe Fair, Knepp Castle. I’m always looking for new fairs to try out. 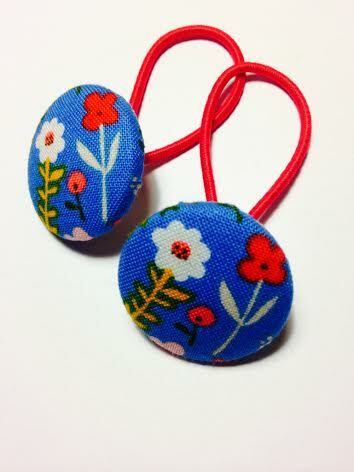 I would love to expand my range to include textiles and cards. I’m a very creative person and would love to have more time to put into the business (currently I juggle it around a full-time job). 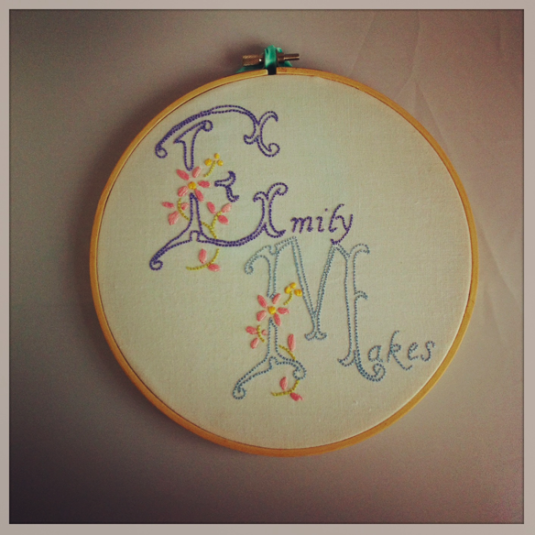 I’ve also been taking part in the Etsy Mentor Month (the Brighton Sellers Team are fabulous!) This will hopefully boost my online sales – it’s been very worthwhile and have a brilliant mentor. I’m really looking forward to the Fairytale Fair – I’ve heard so many good things about it from lots of diverse sources. 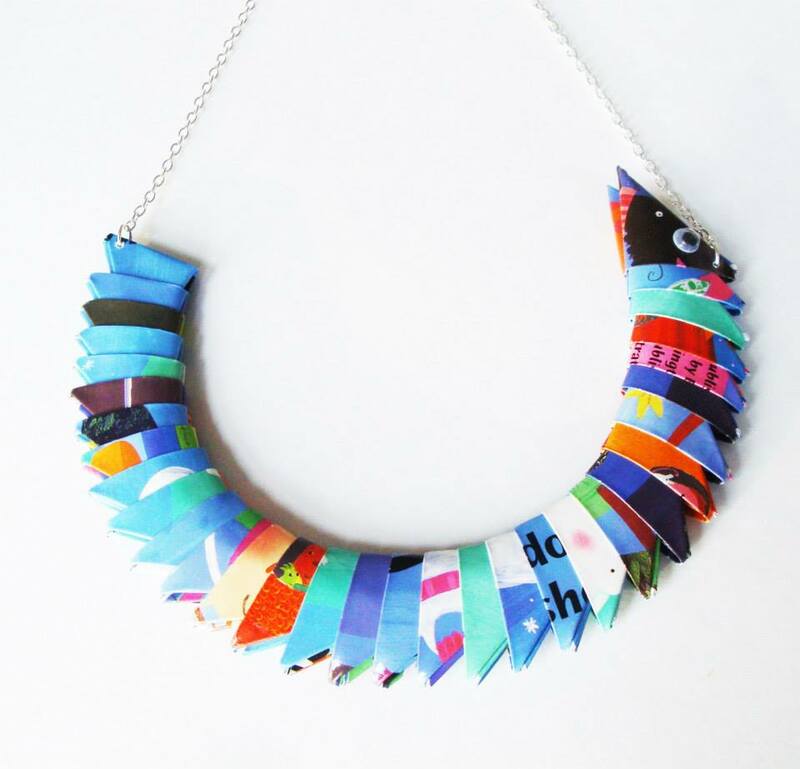 It sounds like something different with craft workshops so everyone can get involved. 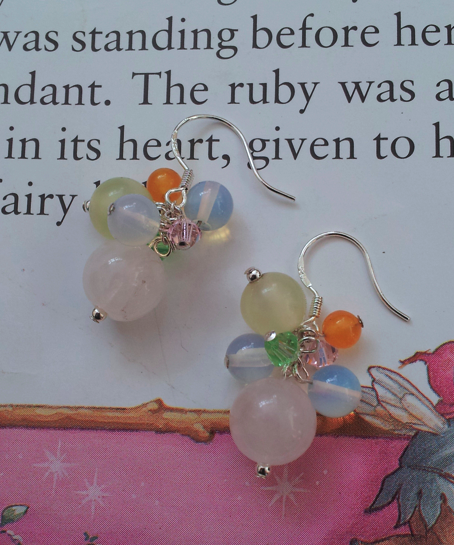 I already have some cute things for little ones but I’m excited to create some fairy inspired items too.